HomeAid Northern Virginia and Builder Captain KSI Management completed a renovation for the Ronald McDonald House, located at Fairfax Hospital. Work included exterior re-grading to prevent water collecting in a below grade stairway and interior work which includes a new microwave in the main kitchen and a new washer and dryer hook up in the community laundry room. KSI Management staff included Sean Asbury and Carl Mayse. Sun Ventures assisted with the landscaping and grading work. 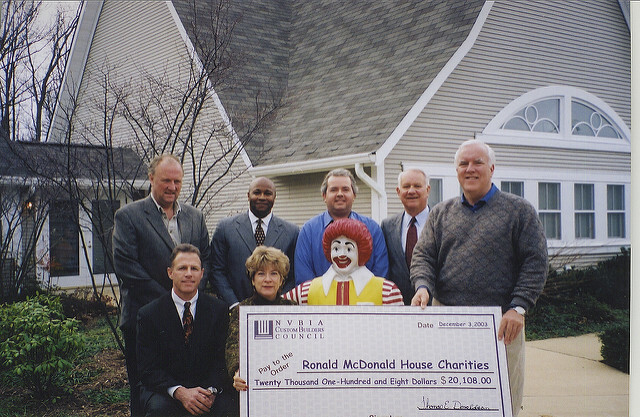 The Custom Builders Council of NVBIA donated $11,150 to The Ronald McDonald House. This donation was made with the proceeds of The Parade of Homes, an annual event held each fall. The Custom Builders Council has donated to The Ronald McDonald House for many years. NVBIA and The Custom Builders Council are listed in the Ronald McDonald House Charities Letters From Home; 25 Years of Caring Annual Report. Debbie Wargo, Executive Director of RMHC of Greater Washington, DC presented a plaque to The Custom Builders Council, thanking them for their generosity. Plaques were given to a representative of KSI Management by Russ Rosenberger on behalf of HomeAid , thanking them for their work. Thank you, KSI Management and the following Trade Partners, for your incredible work on this project!